Much of the Northern Hemisphere is covered in snow this week, even places like Las Vegas that normally never see the white, icy stuff have experienced falling snow. We’ve written previously about how to create and use artificial snow but now that the real thing is right outside the window, what can you do to maximize the impact of snowy images? It’s tempting to limit winter images to simple landscapes, especially early in the day after a night of falling snow. The scenery is beautiful and peaceful but unfortunately everyone else has the same plans. One simple idea: add something red to the shot or angle to catch red berries or a person in a red parka walking in the scene. It rarely snows on Bainbridge Island but we have had snow falling and staying on the ground for days perhaps as much as 8 or 9 inches over the past five days. Driving into town this morning, I noticed that in a sea of frozen white, what really pops out is red: red berries, mailboxes, doors, a red barn, a hip snowboard kid wearing a red parka, a grandmother in a red coat, a red scarf on a snowman and red sleds everywhere. To go beyond predictable snow scenes add humor or a wacky point of view: a golfer playing golf on a snow-covered course; people putting the final touches on a very funny snowman. A snowball fight. Don’t neglect the negative sides of a blizzard: cars in a ditch, someone falling on ice or shoveling snow from a walkway…something that someone I live with is attempting to do with a dustpan as no one seems to have a snow shovel for sale or to borrow in the midst of this unusual set of storms. Show snowplows on the road and slow moving traffic i with heavy snow falling. 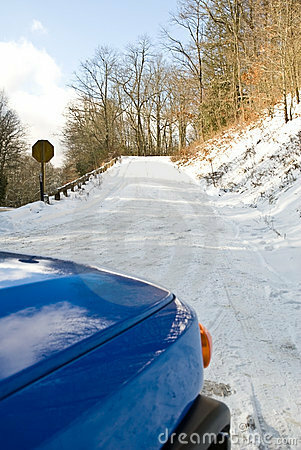 You'll notice a blotch of red in a white scene as you travel on the road...that would be a stop sign or other warning sign. Signs are sometimes used in a metaphorical fashion. Such as "skating on thin ice' to mean that a person is perhaps taking too big a risk in business or personal matters. When the sign is shot in the snow, everyday distractions are avoided and since stop signs are almost always in red: the impact is great. One of the best illustrations this season that I’ve seen is a snowman making a snow angel. Fido in a red winter coat-the dogs around here dress better than some people! Photo credits: Lawrence W Stolte, Designwest, Graham Dance, Beat Glauser, Madartists, Michael Flippo, Pierrette Guertin, Pro777, Roberto Caucino, Dmitry Yashkin, Swimnews, Vyacheslav Osokin. Thanks -as always- for the idea's! Thank you for the tips! It snowed here in Colorado Springs yesterday so I'll have a chance to use the tips soon! It's a great idea, but we have nearly never snow here. I've made some other photo's with something red. i will remember these great advices if snow is around me-unfortunately we never ever have snow in port elizabeth. sunny greatings from the hot side of earth and a happy new year! Great ideas as always!! Thanks you and Happy New Year! dumb me, I didn't think to walk around and get the sign. Still a lot to learn! THANKS for the compliment and I wish I could claim the images in this blog as my own but they are all from talented Dreamstime photographers and illustrators. I am only the writer! I like the idea of using contrast colors on white snow. Thanks Ellen. Merry Christmas. thanks, these are great ideas.